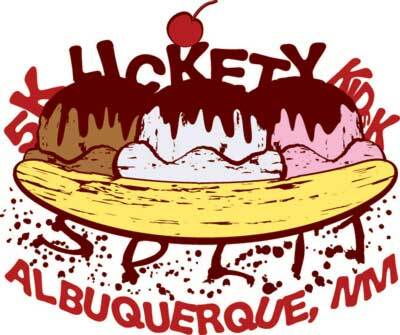 Register today for the Lickety Split Run: 5K and Kids K. This is great way to kick-off your summer of running and the first of three--"Triple Decker"-- in a line of RunFit summer of ice cream series. Look for the Cherry Garcia Run (6/23/19) and Chunky Monkey (7/14/19) Age Group and Overall Awards including, of course, ice cream at the finish. Hurry! You won't want to miss! All registered participants will gain free entry into the Brain Freeze Ice Cream Festival immediately upon finishing! Parking is available at Albuquerque Balloon Fiesta Park. Note: All events will start on time. Race day registration and post race activities will be held near the finish. This race is a Gun Start with a Timing Chip finish. The "official time" will start when the gun/horn goes off. All participants MUST wear a timing chip/bib in order to be factored into the results and be eligible for Overall and Age Group Awards. The event bib MUST be worn on the front of the person and be visible at all times. NOTE: ALL REGISTERED PARTICIPANTS WILL GAIN FREE ENTRY (A $10 VALUE) INTO THE BRAIN FREEZE ICE CREAM FESTIVAL IMMEDIATELY UPON FINISHING. EVENT BIBS MUST BE WORN ON FRONT OF PERSON AT ALL TIMES. BIBS ARE NON-TRANFERABLE AND MUST BE WORN BY THE PARTICIPANT TO WHOM IT IS ASSIGNED. Age group prizes will be given to the top three finishers in the following categories for men and women: 7 and Under, 8-9, 11-12, 13-15, 16-19, 20-24 25-29, 30-34, 35-39, 40-44, 45-49, 50-55, 55-59, 60-64, 65-69, 70-74, 75-79, 80+. All registered participants (11 and under) are eligible to participate in the Kids K. The start of the Kids K will begin at 7:45 P.M. We ask that all participants and parents/sponsors arrive on time for the start. This is a non-timed event. All participants will receive a special recognition award at the finish. This race is a Gun Start with a Timing Chip finish. The "official time" will start when the gun goes off. All participants who want to be timed as well as being factored into the results MUST wear a timing chip/bib. Note: The Kids K is a non-timed event. No timing chips necessary. The Race Director will monitor the weather and make a decision if any action will be taken to modify the race. Possible changes include: altering the start time for the race or in extreme situations, cancellation of the event. Please listen closely to all public address announcements at the starting line of the race. Visible lightning will cause the race to be postponed for a minimum of 15 minutes. Additional sightings will continue to delay the race in 15-minute increments. If extreme heat is predicted, extra water will be provided to the athletes, both prior to, during and after the event. The medical team will be alerted that athletes may require additional medical attention during and after the event due to the high temperatures. Timing of the event will be done using the RunFit’s RACE|RESULT Timing System. Participants must wear a Timing Chip on their shoe in order to receive final results. Efforts will be made to post unofficial results at the finish line within 15 minutes of each participant finishing the race. Results will be posted near the finish immediately during and after the event as well as online at www.irunfit.org. Participants who would like their official time posted and be included in the results MUST wear a timing chip. The timing chip MUST be secured to your shoe (only) using the zip ties (provided) or shoelaces. No timing chips will be given to Kids K participant since this is a non-timed event. Please note: Awards will be presented immediately after each event. All awards must be picked up on the day of the event. No awards will be mailed.